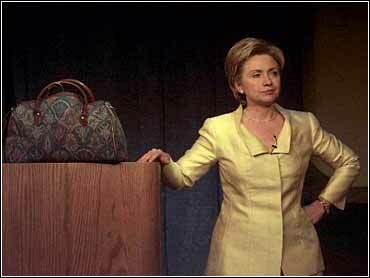 With a real carpetbag in plain view, Hillary Rodham Clinton told a dinner crowd of New York reporters and political heavyweights over the weekend that "funny is not my deal." But the Democratic Senate hopeful in the Empire State had her audience in stitches as she mocked herself on Saturday in Albany, New York's state capital. That's where the first lady appeared onstage following the annual show by the Legislative Correspondents Association, a group of reporters that covers the New York State Legislature. "I'm just like every other New Yorker with Secret Service protection," candidate Clinton, who moved into New York in January, told the audience. Tackling many of the criticisms slung at her during her Senate bid such as being an outsider and not a New Yorker, Clinton walked on stage looking lost and carrying a carpetbag in her hand. In a polished, deadpan delivery, she described her love for her adopted state. "Where else in the world could you stand on a corner and have people yell, 'Go Home' in every language?" she said. "Sixty-seven languages in Queens alone." Noting that she was already on "my second opponent," Clinton provided the audience with a slide show of home photos titled The Woman from Chappaqua, a play on her husband's 1992 presidential campaign video The Man from Hope. Thanks to digital enhancement, the first lady's photos, including one of her as a child and another of her as an adult meeting the Pope, showed her wearing a New York Yankees' hat. "He really liked my hat," the first lady said of the Pope's reaction. She was even wearing the hat during her husband's first inaugural walk down Pennsylvania Avenue, while another picture showed Clinton as a young lawyer wearing the Yankees cap when she worked on the Watergate hearings. "This is from the good impeachment," she said, referring to the Nixon years. The first lady - who grew up in Illinois - came under fire early in the campaign when she claimed she had always rooted for the Yankees in the American League, even while her main allegiance was to the National League's Chicago Cubs. "I was and someday will be permitted to be a Yankees fan," she said. Clinton even poked fun at her everyday fashion style, pulling a black suit out of her carpetbag and saying, "Here's yesterday's suit." Then she pulled out an identical black suit and said, "Here's tomorrow's suit." Clinton also quipped that she was re-releasing her book about children and society entitled It Takes A Village. This time, she said, it would be called It Takes a Suburb - a reference to Chappaqua, the New York City suburb where the Clintons bought a home. Except for her reference to a "second opponent," the first lady focused almost entirely on herself and not on her GOP Senate rival, Rick Lazio. The Long Island congressman attended the show as well, but delined an invitation to speak. Aides said Lazio's late entry into the race, after New York City Mayor Rudy Giuliani quit the campaign last month to deal with prostate cancer, had left them with too little time to prepare for the appearance. Seated at the head table, Clinton and Lazio shook hands before the show began. They spoke only briefly and sat at opposite sides of the round table for 10. Lazio left the dinner early and was not there when Clinton appeared on stage. Rep. John Sweeney, a former top aide to GOP Gov. George Pataki, delivered the Republican response at the conclusion of the show. Sweeney showed a video takeoff on the hit movie Gladiator, in which Clinton was "Statelessius" in a fight against "Split Lipitus." In Sweeney's video, the gladiator with the split lip - a reference to Lazio's fall in a recent parade that left him with a fat lip - won the battle. Clinton's act was one of the rare occasions since declaring herself a Senate candidate that the typically reserved first lady has publicly let down her hair and made fun of herself. In January, she traded quips with late-night talk show host David Letterman on CBS' Late Show with David Letterman.